They may be on tour, but we found a way to have some fun. On a cloudy Thursday afternoon, while most of my blockmates are out of the country and having their tour around the Land of the Morning Calm, I thought that it was a perfect day to do something big, because of the circumstances brought about by these events. 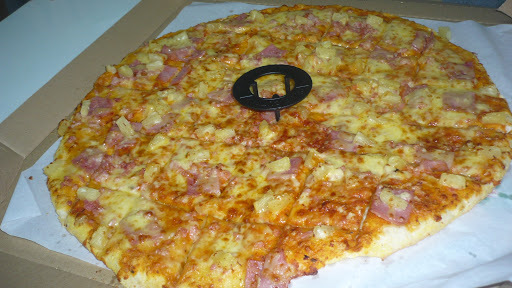 I decided to throw my “victory party” on that daytogether with my blockmates who like me were unable to come to the tour up north. It was a “victory party”, because of my recent successes, and it was a better way for me to say THANK YOU for all their support and prayers in my recent endeavor. It was also a great opportunity to have some fun and celebrate, even if we’re not a part of the tour. We’re not complete on this photo, since not all of us who were left behind showed up. 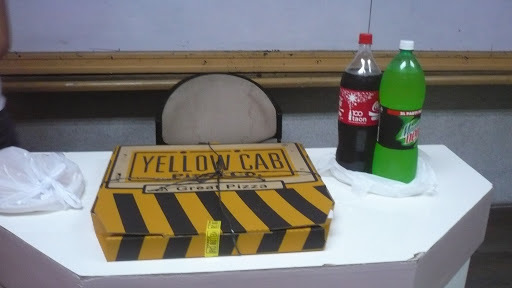 Also a special appearance by our Stat prof.
On the menu for the day was a 18” Hawaiian Yellow Cab Pizza, as well as Coke and Mountain Dew. Which all I paid for, as well as the cups for the drinks. So yeah, we celebrated over good music, great bonding time, and nice food. It was indeed fun for all of us, and I’m happy to have a great time with these fellas over here. I even raffled off the Moonleaf Planner I won at the last contest. Even though the time we spent on this was kinda short, it proves that we can celebrate and have a good time even if we’re not with the rest on tour. Sorry, I can’t help but to show these photos of some of the people special to me. Hehe! I’m not sure if this will ever happen again in my lifetime as a Thomasian student, but I would like to thank my blockmates Gui, Trixia, Marx, Nicole, Amethy, Carms, Marrick, Era, Cza and Abi as well as my good friend Tony and of course our Stat Prof Sir Robert Arenas for the opportunity to spend this great time together last Thursday. 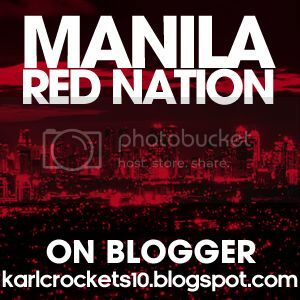 So as I write this blog entry, well they’re on their way back to the Philippines, and my “interesting” week comes to an end. Interesting in a sense, how would the school week go with most of people in my class gone on tour. Well, it lived up to what I expected of this week, and it’s back to reality for all of us next week, and one last contest for me to end the month with a BANG! Thankful and Blessed. Who says we can’t have some fun? 2013 NBA All-Star Weekend Special! With the busy personal schedule I have been having over the past few weeks, I was unable to write the NBA weekly blog for the past few weeks. Well, today here is a special edition of the NBA weekly blog, the 2013 NBA All-Star Weekend Special! The West defeat the East 143-138 in 2013 All-Star Game. For the third straight season, the Western Conference All-Stars defeat the Eastern Conference All-Stars at the 2013 NBA All-Star Game held at the Toyota Center in Houston, Texas with the score of 143-138. Leading the way for the West was Clippers point guard Chris Paul who came up with a double-double 20 pointsand 15 assists, together with 4 steals. Paul was also crowned the All-Star Game MVP. Thunder forward Kevin Durant led all scorers with 30 points, 6 rebounds and 2 steals. Paul’s Clipper teammate Blake Griffin added 19 pointswhile James Harden of the host team the Houston Rockets scored 15 points off the bench. The East were led by the Knicks forward Carmelo Anthony who finished with a double-double 26 points and 12 rebounds. Heat guard Dwayne Wade added 21 points, 7 assists and 2 steals. While his teammate LeBron James added 19 points and 5 assists. Pacers guard Paul George came off the bench and scored 17 points. Meanwhile, on a revamped All-Star Saturday Night festivities, the West led by captain Chris Paul also knocked off the East led by captain Dwayne Wade 140-125 and came home with US$350,000 for their chosen charities, the East came home with US$150,000 for their chosen charities. In the Sears Shooting Stars, Team Bosh composed of Chris Bosh, Swin Cash and Dominique Wilkins defeated Team Westbrook composed of Russell Westbrook, Maya Moore and Robert Horry with the time of 1:29 in the Championship Round which gave the East 10 points. However, the Westcomposed of Team Westbrook and Team Hardencomposed of James Harden, Tina Thompson and Sam Cassell won the Team Round which gave them 20 points over the East teams of Team Bosh and Team Lopez which was composed of Brook Lopez, Tamika Catchings and Muggsy Bogues. In the Taco Bell Skills Challenge, Trail Blazers rookie guard Damian Lillard defeated 76ers guard Jrue Holiday in the Championship Round with the time of 29.8 seconds to give the West 10 points. However the East team composed of Holiday, Pistons guard Brandon Knight and Hawks guard Jeff Teague defeated the West team of Lillard, defending champion Tony Parker and Rockets guard Jeremy Lin to give the East 30 points in the Team Round. In the Foot Locker Three Point Shootout, Cavaliers guard Kyrie Irving defeated Spurs forward Matt Bonner 23-20 in the Championship Roundto give the East 10 points. However the West team composed of Bonner, Hornets forward Ryan Anderson and Warriors guard Stephen Curry defeated the East team of Irving, Knicks forward Steve Novak and Pacers guard Paul George to give the West 40 points in the Team Round. In the Sprite Slam Dunk Contest, Raptors guard Terrence Ross got 58% of the vote as he defeated defending champion Jeremy Evans of the Utah Jazz which gave the East 55 points for the championship round. However The West dunkers of Evans, Clippers guard Eric Bledsoe and Nuggets forward Kenneth Fariedhowever came up on top in the Team Round as they defeat the East dunkers of Ross, Pacers guard Gerald Green and Knicks guard James White to score 50 points in the Team Round. *Ross and Green who scored two 50 dunks for the East gave the East 20 bonus points. Lastly, in the BBVA Rising Stars Challenge, Team Chuck defeats Team Shaq for the second straight season with the score 163-135. Nuggets sophomore Kenneth Faried led Team Chuck with a double-double 40 points and 10 rebounds and was crowned the game MVP. Spurs sophomore Kawhi Leonard and Cavaliers sophomore Tristan Thompsoneach scored 20points for Team Chuck while Kings sophomore Isaiah Thomas added 18 points and 10 assists. Cavaliers sophomore and last year’s game MVP Kyrie Irving led Team Shaq with 32 points, 6 rebounds and 6 assists. Irving’s rookie teammate Dion Waiters added 23 points. Trail Blazers rookie Damian Lillard added 18 points while Rockets sophomore Chandler Parsons added 13 points. For the last time as one team, we came out as CHAMPIONS! Well they’re in the Land of the Morning Calm, while I’m one of those staying behind. Last Saturday February 16, for the very last time as one team, we competed on our final competition on a hot morning at the DENR Social Hall in Quezon City as we competed in the Domestikwhiz 2013 organized by the UP Club for Environment and Tourism. 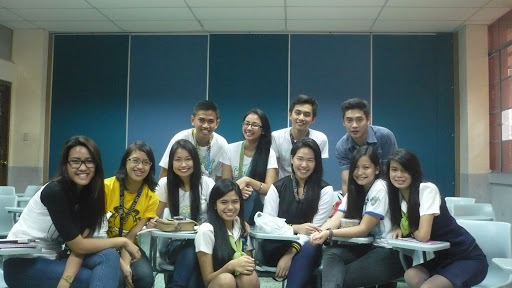 We competed against eight schools from all over the Metro in this quiz bee. Like in the other contests, we came out swinging and got off to a great start as we got a good lead early, however in the final round the questions grew tougher and we failed to answer some questions, at the same time there were questions where no one got the right answer. At the end of the competition, we thought we haven’t done good enough. The emotion of defeat and the feeling of Baguio all over again was in us. However, faith had other plans for our team, as we came out as the CHAMPIONS in the Domestikwhiz 2013! It was indeed a heavy feeling being lifted away from us after the winners were announced. 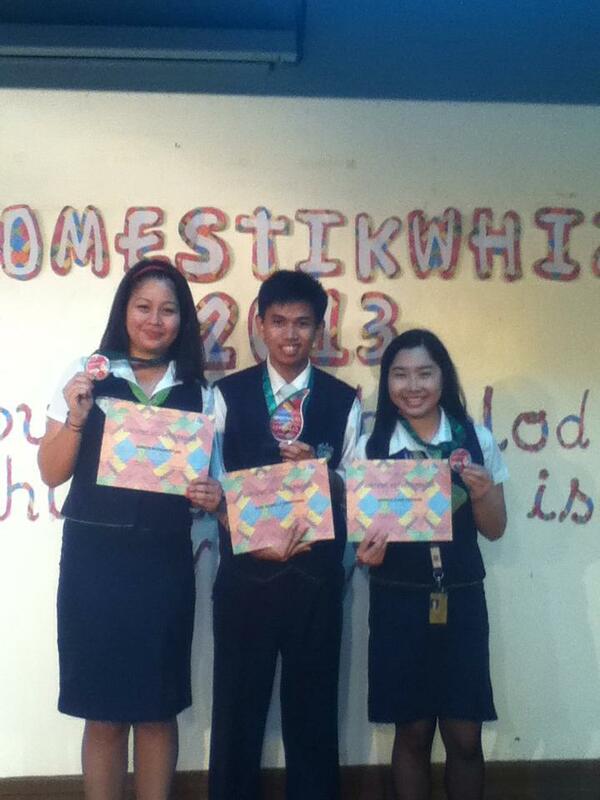 So we took home medals for each of us, a trophy, Moonleaf planners, and a cash prize which we got to share later on. It was a great feeling that we got to end our journey together on a high note. After the contest, we returned to UST where in CTHM it was interview season all over again as prospective high school students took their chance to get into UST-CTHM where we showed up with the admin. Also we got to enjoy one final lunch as one team at Yellow Cab. So yes, our journey has come to an end as both of my senior teammates will now focus on the final months of their España journeys. So, I will take this moment to once again thank my teammates Ate Kriskyn Cabrera and Ate Marian Buenaventura. I would have not made it this far without you fellas and I’m going to miss you both as teammates. I couldn’t ask more of you as being great teammates. It was indeed a great honor and privilege to meet you both. Don’t worry I’ll be fine from here on out. as I prep up for my last competition which will be the UFTE at the end of the month. Also, we would like to once again thank our mentors, Ma’am Tin and Ma’am Jane. As well as our families, our classmates, our friends, our batchmates and the entire CTHM and Thomasian community for all the support and prayers. This would have never been possible without all the love and support you have given us. As always, we Thank God for the opportunity and all the blessings you have given us throughout this process, and for the last time as one team we came out as CHAMPIONS! Meanwhile, well most of my blockmates as well as some of my batchmates are right now in the Land of the Morning Calm South Korea as part of the international tour. However, I’m still right here in the Philippines since I wasn’t able to afford the tour because of the high cost to get there as well as the winter clothing needed to survive the very cold weather there. Well, it will be still an interesting week though, since only 12 of us in the class are left behind here in the Philippines. I can’t wait to see how this week will play out as well as the short schedule as some of our mentors are with the group in Korea. IN OUR LAST HURRAH, WE CAME OUT ON TOP! But the job is not done! The City of Pines experience, all in for the glory. Last February 9, after all the preparation and the long training hours leading up to this, it all came down to one day. As we competed in the 2nd National League of Tourism Students of the Philippines Skills Olympics 2013 held at the University of Baguio campus in Baguio City. We arrived in The City of Pines, the day prior to the competition in the afternoon after a 6 hour trip from Manila. We stayed at the Hotel Veniz at the center of the city, which gave me fond memories of my last trips to Baguio which I had not visited for the last 3 years. As expected, we got a feel of the cool weather the city experiences, it was indeed an escape from the sometimes hot weather in Manila. We spent dinner at Tokyo Tokyo in SM City Baguio and also spent the night doing our final reviews for the competitions we‘ll be competing on the next day. Then the following day, after breakfast at the hotel, we checked-out of the hotel, but kept our luggage at the lobby at the hotel for safekeeping and then went to the campus of the University of Baguio for the competitions. 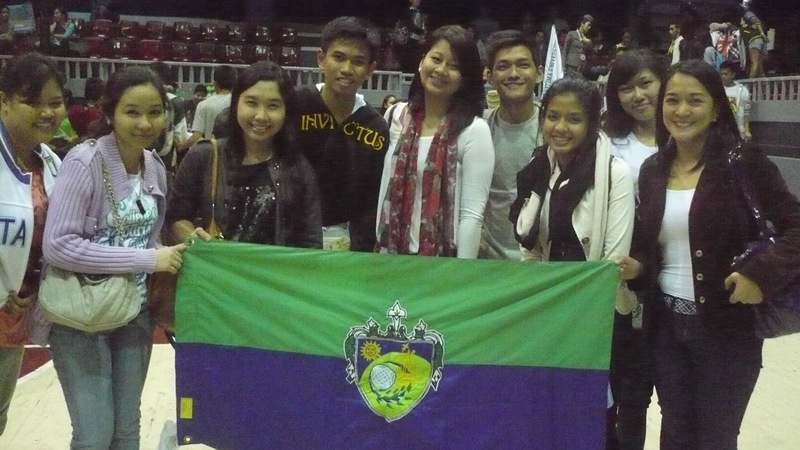 We had the smallest contingent in Baguio as it was only nine of us (7 students, 2 mentors) representing UST. 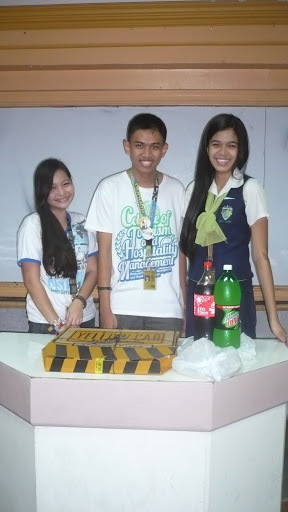 Once again, our quiz bee team composed of my two seniors Kriskyn Cabrera, Marian Buenaventura and yours trulycompeted in the Tourism Quiz Bee. In the elimination round, we came out on top answering all but four of the 20 questions to advance to the final round. Unfortunately in the final round, we settled for a third place finish as we only got 3 of the 10 questions. The contest was won by the contestants from Far Eastern University while the contestants from St. Louis University Baguiofinished in second place. It wasn’t only us who competed in Baguio for the Skills Olympics, two of my classmates Jeanie Tan and Kimberly Tecson competed in the Tour Package Propsal competition, they finished in second place together with the participants from Far Eastern University. The biggest winner of the day was our batchmate Jr Sio who won first place in the Virtual Tour Guiding International Category. Let us not also forget the effort put up by our batchmate Lyka dela Cruz who competed in the Virtual Tour Guiding Domestic Category. After the competition, we went to the Baguio City Market to buy some souvenirs to bring home to our families and friends. I was able to buy the famous Ube Jam and Peanut Brittle as well as some bonnets. Then we went on a celebratory dinner at Max’s in SM City Baguio. Before we boarded our bus back to Manila, we went to the night market along Harrison Road to buy some souvenirs (as well look for winter clothing especially that the international tour to Korea my blockmates will be attending is closing in). Afterwards, we went to the terminal and boarded the bus for the 6 hour trip back to Manila. This experience is something special for me, since this trip to the City of Pines is like a consolation for me due to the fact that I will not be joining my friends, classmates and batchmates in Seoul, South Korea next week for their international tour as I got to experience cool weather (not as cold as in Korea this time of the year) and the fact I get to experience this with great company. It is indeed a great honor to represent the college and the university in this competition as well as once again bringing glory for the university. Like last time, I have everything to gain and nothing to lose. So it’s one down and two more to go for me, though the job is not done yet and there are a couple of competitions to go, I’d like to thank once again our mentors Ma’am Jane Devanadera and Ma‘am Christine Cabigao as well as members of the faculty and the CTHM administrationfor being a great inspiration to each and every one of us who competed in these competitions. We would also like to thank our families, our classmates, our friends, our batchmates and the entire CTHM and Thomasian community for all the support and prayers. We would have not made it this far without all the love and support you have given us. Please continue supporting us in the upcoming competitions that we will be having next including the Domestikwhiz Quiz Bee this Saturday, it will be the last hurrah of our quiz bee team as for the last contest, it will be myself representing UST at the UFTE Quiz Bee at the end of the month. As always, we Thank God for the opportunity and all the blessings you have given us throughout this process. WE MAY HAVE NOT WON ALL CONTESTS, BUT AT LEAST WE DID NOT GO HOME EMPTY. THE CAMARADERIE LIVES ON! TEAM UST-CTHM! Rajon Rondo’s season is over after ACL injury. Rudy Gay sent to Toronto. Popovich to coach the West at the All-Star Game. Award winners for January. Rajon Rondo’s season ends with ACL injury. Last season, two point guards had their seasons end with the ACL injury. First it was the Timberwolves’ Ricky Rubio in which the injury derailed Minnesota’s chances of making the playoffs that season, then it was the Bulls‘ Derrick Rose who suffered the injury on the 1st game of the NBA Playoffs, and derailed Chicago‘s title pursuit as they got eliminated in the 1st round by the Philadelphia 76ers. 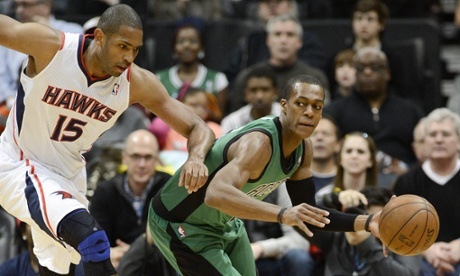 This season, another point guard‘s season is derailed by a torn ACL in the Boston Celtics star point guard Rajon Rondo. Rondo’s ACL injury was confirmed before their battle against the Miami Heat at home as they stated Rondoplayed hurt during their loss against the Hawks in Atlanta. The Celtics however have won 3 straight after the loss of Rondo as well as the season-ending back injury of rookie forward Jared Sullinger. Rondo, in 38 games played this season finished with averages of 13.7 points per game, a league-leading 11.1 assists per game, 5.6 rebounds per game and 1.8 steals per game. Losing the man who will be the face of the franchise in the future is indeed a huge blow on any team, now the question is how will the Celtics respond with this adversity they are facing right now. That we will have to find out soon. Also with Rondo‘s injury, he will also sit out the 2013 NBA All-Star Game in Houston this month where he was voted in as a starter for the Eastern Conference. Replacing Rondo will be Brooklyn Nets center Brook Lopez who will make his All-Star Game debut. Rudy Gay sent to Toronto in three-team trade. In a radical franchise move, the Memphis Grizzlies dealt their star swingman Rudy Gay to the Toronto Raptors as part of big changes the new ownership of the Grizzlies franchise has brought in town. The Grizzlies then got Ed Davis and Jose Calderon from the Raptors. They would eventually send Calderon to the Detroit Pistons for Tayshaun Prince, the last guy from the Pistons’ championship team in 2004 and Austin Daye. Gay would make an instant impact with his new team as he led the Raptors to a 98-73 victory against the Los Angeles Clippers at home. Coming off the bench, Gay scored 20 points in his debut with the Raptors. Prince also made his presence felt in Memphis as he scored 14 points off the bench in the Grizzlies’ 85-76 victory against the Washington Wizards. While Calderon was in attendance for the Pistons-Cavaliers game in Detroit, but did not play due to visa issues. In a dubbed win-win trade for all three teams involved in the trade, there are questions on how these players will make an impact to their teams. Like how will the Grizzlies continue to contend in the West with the radical lineup change? Can Gay lead the Raptors to the playoffs? and how will the trade help the Pistons as they go along with the season. That we will find in the days to come. 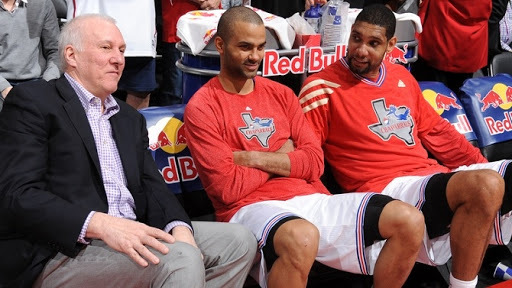 Popovich named West coach in 2013 NBA All-Star Game. For the third time in his coaching career, San Antonio Spurs head coach Gregg Popovichwill call the shots for the Western Conference at the 2013 NBA All-Star Game in Houston thanks in part to the Spurs’ league leading performance in the first half of the season as they are riding a 10 game winning streak, Popovich coached the West at the All-Star game on two separate occassions, one was in 2005 in Denver, while the other was in Los Angeles, 2 years back. The head coach of the Eastern Conference at the All-Star Gamewill be determined in the game between the Miami Heat and the Toronto Raptors in Toronto. If the Heat win, head coach Erik Spolstera will coach the East, while if the Raptors win, New York Knicks head coach Mike Woodson will call the shots. LeBron James of the Miami Heat wins his 3rd consecutive Eastern Conference Player of the Month Awardwhile Tony Parker of the San Antonio Spurs wins in the Western Conference. Damian Lillard of the Portland Trail Blazers wins his 3rd consecutive Western Conference Rookie of the Month Award while Bradley Beal of the Washington Wizards wins in the Eastern Conference for the 2nd consecutive mark. Meanwhile for Coach of the Month we have 2 new winnerswith George Karl of the Denver Nuggets taking the honors in the Western Conference, while Tom Thibodeau of the Chicago Bulls took the honors in the Eastern Conference. Also Kyrie Irving of the Cleveland Cavaliers took home the Eastern Conference Player of the Week Award in Week 13, while Tony Parker of the San Antonio Spurs took the honors in the Western Conference. Stay tuned as another edition of the NBA weekly blog comes your way next week! The busiest month has arrived. Because saying it’s the "love month" is too mainstream. One month in 2013 is in the books, now the month February has arrived. Well, it’s the love month as most people would say because of Valentine‘s Day coming up a few days from now, but in this blog entry, saying that it’s the love month is too mainstream. I say, that February will be the busiest month for me. I rant about it all the time every time this time of the year comes, because Valentine’s Day for me is “JUST ANOTHER DAY in my LIFE.” Well because, I got no special someone to spend it with. Others may not agree with what I say, but that’s how I see things on that day. Ask me a Valentine‘s Day question and I will not answer. It’s my personal choice of doing this every year. So when that day arrives, expect no flowers nor chocolates coming out from me as well as me making a move on a lady, well because I’m not into giving gifts because I don’t have enough money with me most of the time. Maybe one day, I could say that it’s really the love month, but now it’s just too mainstream in my view. So that’s enough of the love talk, like the title says, February will be the busiest month for me. That’s because I got a lot of things to do. I’ll be joining competitions once again this year, not one, not two, but three! A week from now, we’re off to Baguio to compete for a quiz bee as a team(it’s also a consolation for me to get some cold weather since I’m not joining my classmates and batchmates who will go to Seoul, South Korea this month) and some of my friends who will also compete in other contests will join along, then a week later we’ll be competing again in UP for a Ecotourism quiz bee, it will also be the last time our team over the past year will compete together since both my teammates are graduating this March. Then finally, it’s The Big One!, as I will compete at the end of the month in the UFTE Quiz Bee at The Fort. With all of that, I’m now into intense training and preparation every after class until the end of the month to prepare myself for these things. I’m hoping for the best in all the competitions I’ll be joining this month. I made this and got some inspiration from shirt designs and slogans of adidas. Aside from the competitions I’ll be joing this month, I’ll also get busy with school work, because there are a lot of requirments to be passed, as well as work on different activities like quizzes, seatworks, assignments, among others. Even projects where I’m the captain, I need to step up my game a notch. It is going to be tough, yet it will be a rewarding experience when it all ends soon. It was also tough to see one of my great mentors leave before the semester came to an end, well because that mentorwas great in their craft, at the same time being an inspiration not only to me, but also to all of the students that this mentor has touched over the years. That lead me to ask the question, “Why do the great mentors leave so early?” I have a lot of mentors throughout my entire life, however there are some who leave their mark and I remember very well of them than others. There are some who can relate to the students, some who have great minds and a lot of wisdom, and some who gave a lot of faith in you over the years. 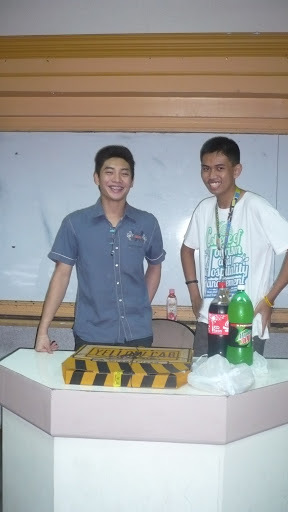 For that mentor, I wish all the best in their future endeavors and I hope to see you soon. Anyway, this month is also All-Star month as the 2013 NBA All-Star Game comes to the Toyota Center in Houston, Texas. This will be the second time in my lifetime, that I’ll see a All-Star game play out in Houston, home of my favorite team the Houston Rockets. I cannot wait to see James Harden play in his first all-star game after a breakout season with the Rockets after the trade from the Thunder before the season began, also a note on Chandler Parsons who will also make an impact in the Rising Stars Challenge. Well, you can call the month of February anyway you want, but we should remember to make each day count. Time is flying fast these days. Blessed and loaded for the win!